How do you keep children safe from guns? Answers to this question have been debated everywhere from suburban PTAs to cable news to Congress, and still approximately 1,300 children are killed by guns each year – 10 percent of which are accidental shootings. A group of physicians and residents at Boston Medical Center say the answer to this is clear: the only true way to keep children safe from guns is to not have guns in the house with children. 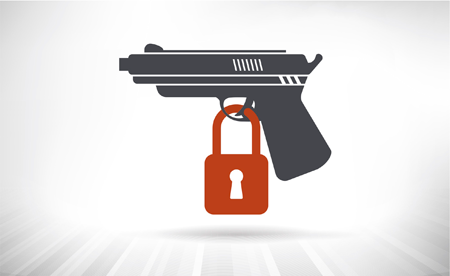 To this end, the Pediatrics Department has committed itself to asking patients and their families about guns in their homes and around their neighborhood and recently began offering free gun locks to all families. Unlike in other states, there are no restrictions on asking about guns in Massachusetts, so pediatricians take time during routine health maintenance visits to counsel patients and families on this issue. The questions they ask are part of the American Academy of Pediatric recommendations for checkups. The guidelines – which are part of the ASK campaign – is the only national safe gun storage program that has been independently evaluated by the nonpartisan Government Accountability Office and found to be effective. In addition, the questions have been included in Epic electronic health records, underscoring the importance of gun safety to health. Questions are tailored to the child’s age group. For example, a provider might ask the parents of a toddler if there are guns in the house and if so, how they are stored. If the child is in elementary or middle school, a provider can also encourage parents to ask other parents about guns in the house and ask the patient what they’ve learned about guns and gun safety. While many parents assume that their young child doesn’t know about guns in the house, Palfrey says research shows this isn’t true. Providers try to talk to older children about guns both with their parents and alone and should also ask questions like if they know where they could get a gun or if they ever store guns for their friends. Teenage girls, for example, might hold guns for their partners, while other teenagers might share a gun within their group of friends. Palfrey says that less than five percent of patients or families say they have a gun in the home – and that he believes 80-90 percent of them. In order to reach all families with guns in the home or who may have friends or family with guns in their home, the Pediatrics Department began offering free gun locks to all families, regardless of their answer to this question. These locks prevent guns from being fired when the trigger is pulled. The department will be tracking not just how many locks they give away, but specifically how many are taken by people who say they do not own a gun. Extending outreach to other groups is the most crucial part of curbing gun violence, say Holmstrom and Palfrey. Families don’t usually operate in isolation, and therefore you can’t make lasting change without working with others, from the Emergency Department, Social Work, and other departments at BMC to community organizations and schools. Connections to community organizations are particularly important because potential gun violence at home is only one of many challenges for many of our patients. For example, if patients don’t feel safe in their neighborhoods, BMC helps link them to resources that can help them find new housing. Medication for opioid use disorder is considered best practice at BMC and throughout much of the medical community, but this type of treatment doesn’t exist for some other substance use disorders. A group of researchers at BMC is trying to change that for patients with cocaine use disorders in an unusual way – with a drug typically used for weight loss. The team, made up of members of the Department of Psychiatry, is studying a drug called lorcaserin, which targets the brain’s serotonin receptors. Their goal is to determine if it can help reduce cocaine cravings as well as dampen the rewards associated with taking cocaine. The study is built on previous research with lorcaserin, and other medications that have similar effects on serotonin receptors in the brain, which suggests that it may help people to reduce cocaine use, as well as reduce the risk of returning to use after quitting. Lorcaserin is currently FDA approved to help adults who are obese or overweight and have weight-related medical problems lose weight. There are currently no medications approved by the FDA to treat cocaine use disorder, according to Eric Devine, PhD, the study’s principal investigator. “Finding a medication to help people stop using cocaine would be a real game changer. We don’t know if lorcaserin will help people with cocaine problems, but prior studies suggest the potential that it will help people,” said Devine. By studying medications already approved by the FDA for other conditions, treatments are more likely to get to the market sooner than starting from scratch. 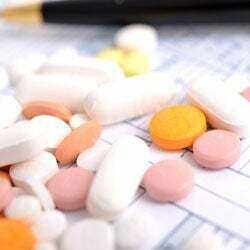 Starting from drug development can take years – even decades. “Within two years, we will know if we have a drug that can help people to cut back or quit using cocaine,” said Devine. All research subjects enrolled in the study will receive cognitive behavioral therapy, a current standard of care for cocaine use disorder. Participants will also be asked if they would like to enroll in an optional four session alcohol intervention, as the researchers recognize that people may want to limit other substances that may be a trigger for using cocaine. The most important thing Jim Conway says he learned in his half century of working in health care administration is how to use creative tension to improve quality and safety in a hospital. Creative tension comes from clearly seeing where you want to be – your vision – but being honest about your current reality. To resolve the tension, you can either raise your reality to your vision or lower your vision to your reality. This, says Conway, is where leadership starts. Conway, a former executive at Dana Farber and current trustee of Lahey Health System, shared this lesson, along with many others, during the 13th Annual Raphael Miara Patient Safety Symposium, an ongoing commitment by Boston Medical Center to confront mistakes and learn from them, so something good can come of them. But leadership that arises out of creative tension is not the only ingredient necessary to improve quality and patient safety. Throughout his talk, Conway highlighted many other components, including a relentless vigilance to safety, risk, error, near-misses, and harm. By setting clear expectations, prioritizing patient and family-centered care, and recognizing our power and responsibility to prevent errors from happening again, everyone throughout an organization can be a leader in quality and patient safety improvement. The FY18 patient safety grants recipients were also announced at the reception. BMC and the BMC Insurance Program sponsors these grants for projects that are designed to improve patient safety and simultaneously reduce liability exposure. BMC was named to Becker's Hospital Review's 2017 “60 Greenest Hospitals in America” list for our progress towards our goal of emitting zero greenhouse gases by 2020. Energy use at the hospital has been reduced by 19.4 percent from 2011. Our rooftop farm also produced nearly 5,000 pounds of fresh produce this year, directly benefiting our patients and the hospital's food and nutrition services. BMC was honored with a 2017 WorkWell Massachusetts Silver Level Award from the Worksite Wellness Council of Massachusetts. 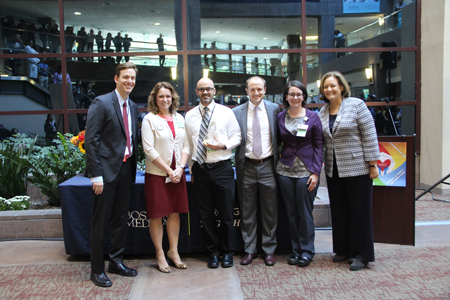 The award recognizes the BMC benefits team’s work in developing and implementing wellness programs that look beyond just an employee’s health status, to also support their financial, mental, career, and social wellbeing. The goal of the program is to reduce daily stressors in employees’ lives and demonstrate the BMC’s commitment to employee wellness by removing barriers, such as cost and availability. Available wellbeing programs and resources include access to certified financial planners, specialty drug prescriptions, an onsite social worker dedicated to supporting employees, concierge services, and classes on topics such as college financing, home buying, and retirement. BMC is working towards making Boston the healthiest urban population in the world and that starts with the wellbeing of our employees! On October 10, BMC and BUSM gathered to honor the men and women of the BUMC Public Safety Department who ensure the safety of our patients, students, faculty, staff and visitors every day. The Department of Public Safety is a full-time, professional law enforcement agency that provides a wide variety of public services, including alarm response, emergency medical assistance, investigating reports of suspicious circumstances, and response to and investigating criminal matters. A full list of public safety officers honored at the event is available on the intranet. Sarah Bagley, MD, director of the CATALYST Clinic, has been named one of the Greater Boston Chamber of Commerce’s 2017 Ten Outstanding Young Leaders. The award honors the work Bagley and her team at the CATALYST Clinic do to treat young adults and teens struggling with substance use disorder. Boston Medical Center’s Violence Intervention Advocacy Program (VIAP) has been approved for an additional $660,000 Supplemental Award from the United States Department of Justice to support male survivors of violence. The money supplements a $1 million grant awarded in 2015. These additional funds will be implemented through 2020 and further the commitment of the Department of Justice to improve the treatment of crime victims and develop and support programs at BMC designed specifically for male survivors of violence. Jeffrey Samet, MD, chief of the Section of General Internal Medicine, has received a $3,674,030, five-year grant from the National Institute on Drug Abuse (NIDA) to implement an intervention aimed at improving HIV outcomes among HIV-positive people who inject drugs in St. Petersburg, Russia, working with colleagues from the First Pavlov State Medical University of St. Petersburg. The intervention seeks to improve coordination between addiction and HIV care systems by combining pharmacological therapy and 12 months of strengths-based case management. The study will assess the impact of the intervention on HIV outcomes and impacts on coordinated care across the addiction and HIV health care systems and its cost-effectiveness. Caroline Apovian, MD, FACP, FACN, FTOS, director of the BMC Nutrition and Weight Management Center, has been elected as the new president of The Obesity Society. A New York Times bestselling author, Apovian has written over ten books, including The Age-Defying Diet,and over 150 peer reviewed original research and review articles on obesity and nutrition. Her papers have been published in the New England Journal of Medicine, Obesity, Journal of Women’s Health, and International Journal of Obesity. Apovian is a founding member of the American Board of Obesity Medicine and has also appeared on CNN and The Today Show to discuss obesity weight management. She has been an active member of The Obesity Society since 1994 and was secretary/treasurer from 2005-2009 and vice president from 2016-2017. Robert Saper, MD, MPH, director of BMC’s Program for Integrative Medicine and Health Disparities, served as the guest editor for the Medical Clinics of North America September 2017 issue. The issue, devoted to complementary and integrative medicine, also features the research of Katherine Gergen Barnett, vice chair for primary care innovation and transformation in the Department of Family Medicine, and Paul Gardiner, assistant director of the Program for Integrative Medicine and Health Disparities.